This week’s Sunday Supper theme is coconut, in honor of National Piña Colada Day. At first I was going to make something with coconut milk, since I have a ton of Thai dishes that I have wanted to try. 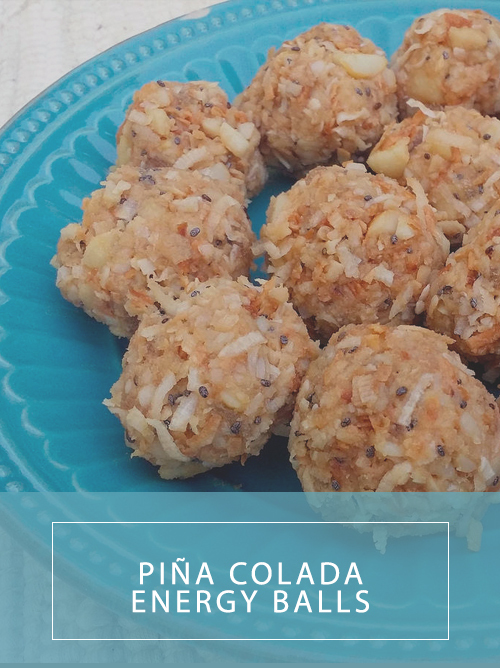 However, I’ve also been wanting to experiment with some new post-run snacks so I decided to ask Google if there was such a thing as Piña Colada energy balls. I had a few ideas of how to convert my favorite no bake energy balls, and after consulting the interwebs I discovered that of people had the same idea. I ended up choosing this recipe from Creative Juice because it had minimal ingredients and did not involve food processing dates. I have the worst luck with that. I whipped up this batch very quickly, even toasting my own coconut on a frying pan on the stove. Amazing! It’s a very forgiving recipe because I accidentally put all of the coconut in instead of saving some out to roll in later. I think the protein powder is an important component in terms of flavor. I recently discovered Bob’s Red Mill protein powder (it also has chia seed in it, which is why you see them in the photographs–although if you use another protein powder you could probably add a tablespoon of chia seeds for the same effect). In a medium bowl, combine 3/4 cups coconut, macadamia nuts, protein powder, vanilla, and honey. In a small microwave-safe bowl, combine water and pineapple. Heat for 20 seconds. Let cool a bit and process into a paste with a food processor. Add pineapple paste to the bowl with the coconut mixture and mix well. Form into 1\" balls. Roll in remaining coconut. The Verdict: Delicious! DH and I loved these little energy balls. Perfect for pre or post workout. I adore these! Not only do they look healthy, but they look DELICIOUS! Sounds like perfect little treats anytime of day! Now THESE may be my new favorite way to get a protein boost!!! YUM!